Well, it looks like I have found the first major flaw that I didn't catch when I bought the boat last fall. I knew that the prop was slightly bent, so I finally pulled it to put a spare on (thanks, Bozboat!) while I have the main one out for repair. Meanwhile, the boat has had a vibration out of the hole, which I assumed was probably the prop. Now that I have the prop off, I see that the strut is not at all aligned with the shaft. I haven't checked the shaft, but it appears to run true visually when in gear on the trailer. So for now I'm assuming that the strut is either slightly bent or has rotated against the boat somehow. When I get a chance, I will go ahead and pull it to check and straighten it while I change the bushings. The question is, when mounting the strut, how much play does it have available to align it to the shaft? 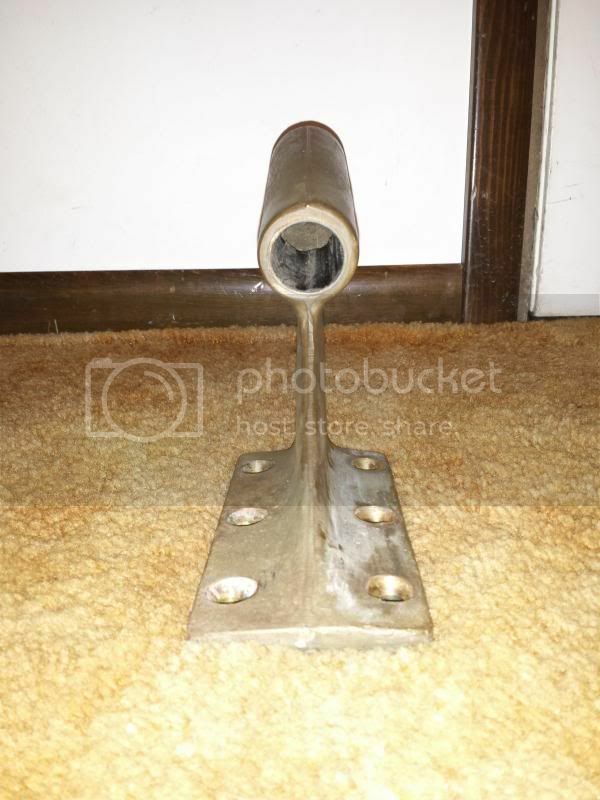 It looks like just six holes in the fiberglass, but does it have a plate on top or anything that would hinder a few degrees of rotation? when i installed my new strut there was for sure a few degres of play either way to adjust the strut from side to side.. Mine didnt have a plate on top or anything just nuts and washers. On a side note pm me if your strut is bent and you need a new one. I have one for sale if you cant find one. I don't know the answer but how easy is it to turn the prop by hand? I also wonder if it is installed sideways or is truly bent/twisted? Well, I pulled the boat out of the shop so I could get to it and have a better view. The strut is definitely bent. Probably the same incident that bent the prop, but who knows? I'm pretty sure the prop has not been off before because the cotter pin is nearly worn through. Anyway, the shaft is straight, so I'm not going to worry about that. I'm going to try to straighten the strut before I replace it, but I'll keep you in mind, build2rev. Thanks for the info, too. 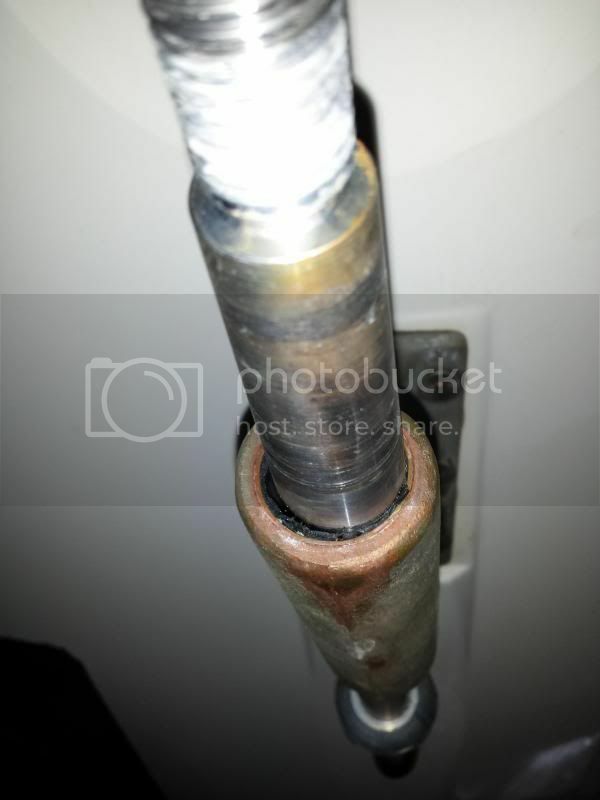 eyekode, it is very difficult to turn the shaft, but you can see that the bushing is bound up and worn due to the diagonal action. Looks just like mine from last year, I will try to dig up my thread for you later this evening. I found a brand new strut down around Houston I think for very reasonable and replaced my bent one with it. yeah de ja vu, isn't that how the cajuns say it anyway>? Is the rudder bent as well? Looks to me like you need to go through everything including engine aliment. You may as well pull everything from the coupling back and start looking at everything. The rudder is fine. I plan to do the alignment after I fix the strut. No sense doing an alignment yet since I can see that the strut is so far out. If I do a good job with the strut, the shaft will be aligned pretty well when I get to that. Boz, that prop has a pretty good vibration at all speeds. We took the boat out this evening for a quick trip with your old prop, and it's quite the buzzer. It's not like running it will ruin my cutlass bearing right now, but I think I'll keep that one as the spare. What did you guys hit to bend your struts? My original prop is not bent very badly, but it is stainless. Re: CVP prop: there are reasons why I gave it away. the SS CVP is rough compared to an acme 515, big difference. I think acme and OJ have try it out programs. Not only is the Nibral prop smoother, but it will take the hit saving the strut and other expensive parts. Took the strut off tonight. I'm still figuring out just how I want to try to straighten it, but it's a pretty simple twist. I'm picturing a large vise and a long pipe (or better, an old shaft, which I don't have). Do you have access to a hydraulic press? Thanks for sharing your progress! 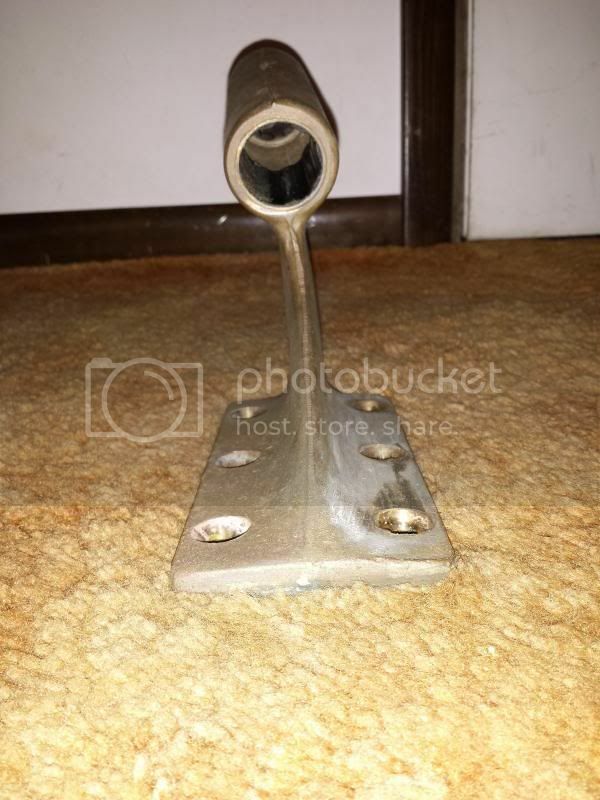 Is the strut just through bolted? I am following closely as I believe mine has a more minor bend and am dreading removing it and aligning everything! Heat is as you do it? So it remains at that shape? That meant I *do* have access to a hydraulic press! I usually can't get to the press stand in the next town during work hours, so I had planned on doing the job a more primitive way. As it turned out, I knew that the press stand was pretty basic, so I took several C-Clamps, large pieces of steel, and an aluminum bar (4"x5"x20") with me in order to make sure I had what I needed. After several way over-engineered setups, I found it much easier to just lay the strut down and press it in the right places to slowly bring it around. A single C-Clamp was sometimes handy to hold the base down while I pressed the forward part of the strut. I'm pretty sure it bent close to the base because of the "Malibu" cast into the side. It looked to me like a cheaper off brand strut may be stronger, so I'll keep that in mind if I have to buy a new one. Anyway, the main bend was directly in line with the cast name, and the twist went on out from there. I don't have pictures of the process, but basically I got the main bend out near the base and then worked on the twist. I looked in the scrap box and found a 12" piece of 1.125 shaft, but the cutlass bushings are so worn that it just flops around. I'll have to wait until I get new bushings to measure closer and tweak the twist a little more, but it's pretty close already. I can do the final adjustment in my vise at home with a pipe and that BFH. I got done just after I got a text message that they got the power turned back on at work. eyekode - Yes, it is just through bolted. You need two people unless you have really long arms, but other than that it's very basic. Well, I spent about an hour getting the old bushings out of the strut, cleaning it up a little, and pressing the new Vesconite bushings in. When I slid it onto the shaft, it was pretty tight. That's OK with me since they are brand new bushings and they were dry. Anyway, the bolt holes in the strut seem to line up really well with those in the boat, so I'm going to install it tomorrow without any further bending or twisting. Hopefully the alignment will be pretty close when I check it. 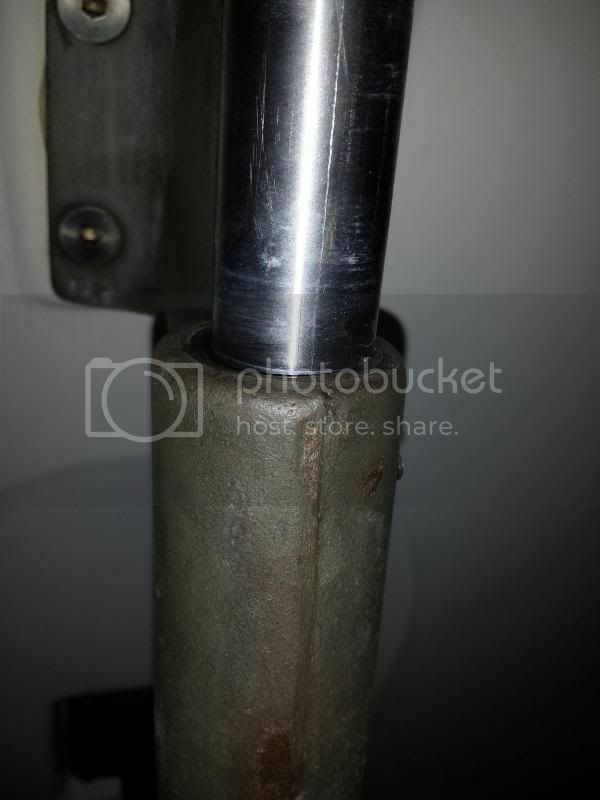 Justgary, when you pulled the strut off the shaft did the shaft pretty much line back up with the rudder? 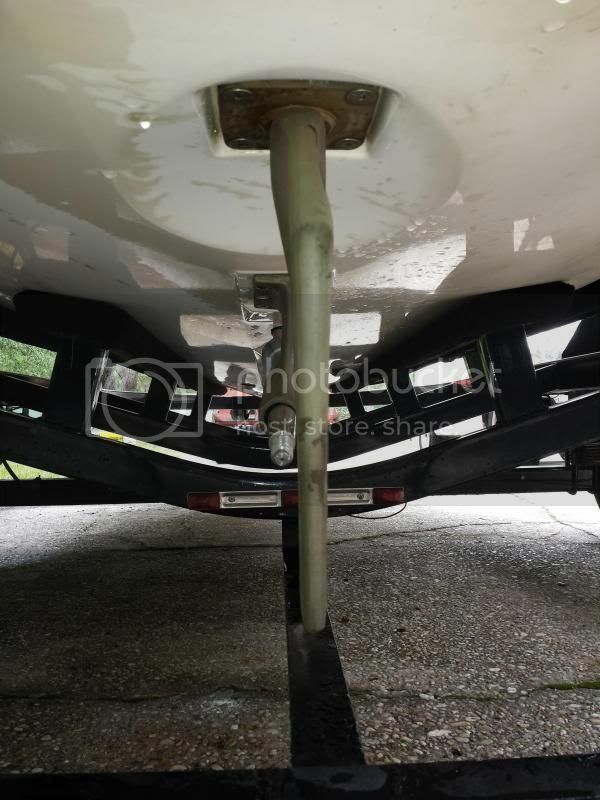 I've got the exact same situation with my boat and am trying to decide if I want to pull the shaft and strut or just try to pull and replace the strut. @justgary: the Vesconite bushings will bed themselves in and the shaft will spin free after a few hours. Mine were tight on first install and when I discussed with OJ, they indicated a few were on the tight side. I do suggest a good alignment to make sure everything is true. Remember when you do the alignment, you will need to take the vertical load off the shaft and coupler off as you install so you do get everything aligned in both twist and vertical directions and don't accidentally lower the engine. Yes, once I pulled the strut it was easy to wiggle the shaft and let it find its own natural center. That ended up in front of the rudder, and I was careful to keep it in that position as I installed the strut. It was nice having tight bushings holding the shaft in place while I checked the alignment. I checked under the packing nut to make sure that the shaft was centered in the log, then did the alignment. I had to move the front of the engine about 0.030" port, and maybe 0.025" down. I now have very little vibration, so the next step is to take the prop in. I figured that tight was OK and wouldn't last, and it spins much easier after just one quick outing. I did the alignment with the prop off, and wound up having to lower the front a bit anyway. I didn't check it again in the water, but it is pretty close now, I'm sure.